BROOKLYN, NY - NOVEMBER 4: Ben Simmons #25 of the Philadelphia 76ers shoots the ball against the Brooklyn Nets on November 4, 2018 at Barclays Center in Brooklyn, New York. After playing good basketball and winning twice at home to start the week, the 76ers (6-5) went to Barclays Center Sunday in search of their first road victory, while also looking to grow some early-season momentum. Those two objectives were put on hold, as the Brooklyn Nets (4-6) knocked off the Sixers, 122-97. While Sunday's Atlantic Division match-up got off to a choppy start for both clubs, it was the Nets that ultimately flicked the switch, and, behind a seemingly unconscious second half, pulled away. Despite depositing just five baskets in the first quarter, Brooklyn shot better than 58 percent the rest of the evening. The Sixers, meanwhile, couldn’t overcome their turnover issues. They committed 17 in Sunday’s first half, and a season-high 28 for the game. Brooklyn transformed those miscues into 39 points. “That is an outlier, in my opinion, of games that this group has played basketball games together,” said Brett Brown. Ben Simmons paced the Sixers with 20 points (8-11 fg), and added 12 rebounds as well. The double-double was his eighth of the season, the 20-10 performance (20 points + either 10 rebounds or 10 assists) the eighth of his young career. 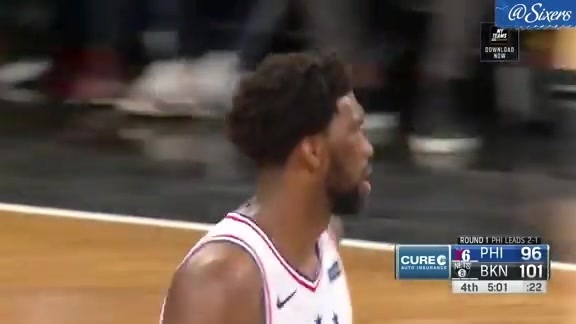 Joel Embiid turned in a double-double, too. With 16 points (4-8 fg, 8-10 ft) and 15 boards, he became only the third player in franchise history (also Wilt Chamberlain and Charles Barkley) to register 10 double-doubles in his first 11 appearances of a season. Brooklyn was led the backcourt combo of D’Angelo Russell (21 pts) and Caris LeVert (20 pts). Chester, Pennsylvania native Rondae Hollis-Jefferson provided 19 points off the bench. “We will stay together and we will move on,” Brown said.
. Click here for a complete box score. Sound advice from @sixers, following this vicious reverse slam dunk in the second quarter from the reigning Rookie of the Year. Although technically on a two-game road trip, the Sixers will first return home before leaving town for Wednesday’s nationally-televised match-up with Indiana. On the heels of a season that saw them take Cleveland to seven games in the first round of the playoffs, the Pacers are off to an encouraging start, at 7-3. Victor Oladipo, a first-time All-Star a year ago, came up clutch in Indy’s match-up against Boston this past Saturday, hitting a 3-pointer with four seconds to go to send his squad to a third straight victory.